I'm absolutely enamored with this design by Casey Noble for HGTV's Design Star (season 5); If I was single in the city, I can guarantee you this would be my apartment. It shows you can create a chic and stylish look even in a small space. The two toned soft blue walls with faux molding are offset by pops of red/fuchsia in the pouf and pillows. 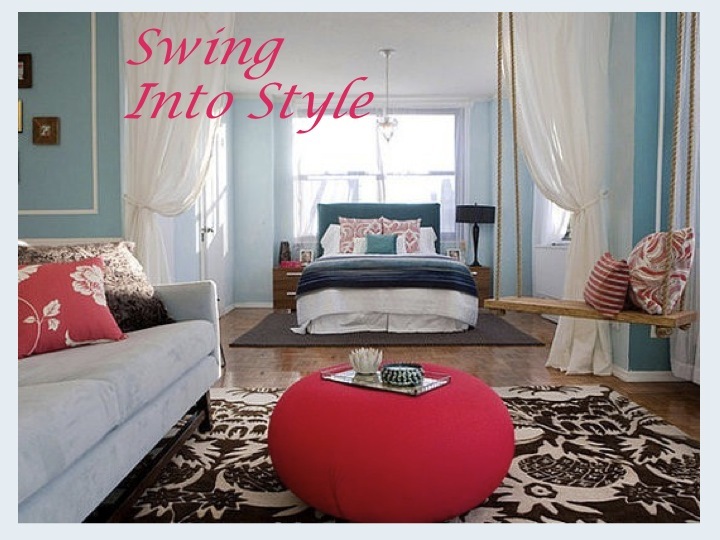 The piece de resistance is the indoor swing, which adds a touch of whimsy to the sophisticated rug and sleek lines of the couch and night stands. Love your blog! Found you on Coco & Kelly...Im your 99th follower! wowowow. that's what my apartment will look like. and a swing? perfect. WOW, what a gorgeous space! Loving this room. How cool is that swing?! Gorgeous!! I love the swinging chair! Lovely! Check my blog and follow me if you want! I love how laid back and feminine this space is...very romantic. Do you ever get tempted to move just so you can re-create one of these interior designs? Sometimes I fantasize about moving just so I can re-decorate everything. i really love the colour of the room,some more this spring summer 2012 is all about soft colour and pastel,i thought of painting up my sis room after she shift to her own hse soon. omg what a pretty room!